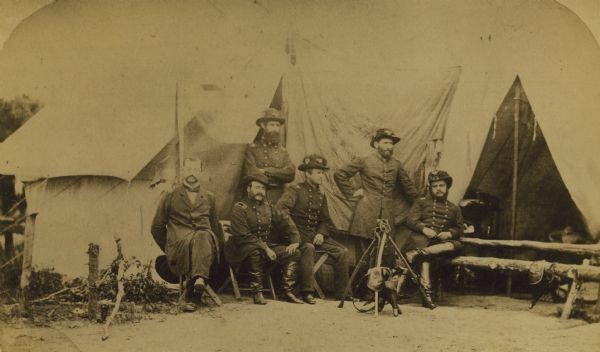 Officers of the Second Wisconsin Infantry posed in front of a tent. They are, from left to right, Quartermaster J.D. Ruggles, Dr. A.J. Ward, Major J.S. Allen (standing), Lt. Colonel Lucius Fairchild, Adjutant C.K. Dean (standing), and Colonel Edgar O'Connor. Fairchild, Dean and O'Connor are clearly wearing the distinctive black hats of the Iron Brigade. The flag of the 2nd can also be seen, unfurled behind them. A varient of this photograph is included in the collection of the Wisconsin Veterans Museum.